Xel-Ha is all inclusive, so all your food, drink, snorkel gear, towels and lockers are include at the park. Our private tours save you time and are the most comfortable and convenient way to see the sights of Mexico! Once you book online and complete the deposit payment, we will send you the confirmation voucher by email. Print your voucher and bring with you to Cancun. It has all the details including our contact info if you need to make any changes. Pricing: It is cheaper per adult the more adults you have total. Child prices remain the same, regardless of number of adults. Kids under the age or height listed above are free. If you are a total of 11 people (including kids) or more, email us for a quote. All Inclusive entrance tickets to Xel-Ha Park, which includes all your food, drinks, snorkel gear, towels and lockers. Note: there is a $25 deposit for snorkel gear at Xel-Ha. Hotel pick up is up to you. Tulum opens at 8AM and it takes 90 minutes to drive from Cancun. 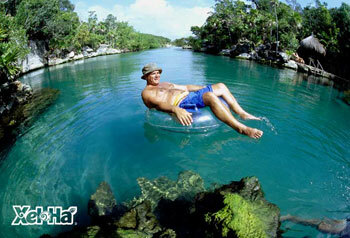 Hire a guide in Tulum for around $50-$75 USD for a 90 minute tour or explore the ruins on your own. 2 hours in Tulum is plenty of time for most people. Set return pick up time with driver (most people like to stay until Xel-Ha closes at 6PM). Swimsuit, Sunblock (biodegradable), hat, sunglasses, Dry t-shirt, Camera. KIDS: Children from 5 to 11 years old pay child price. Children under 5 years old are always free! Children under 12 years old but taller than 55 inches tall, proof of age is required. Make sure to bring this with you!